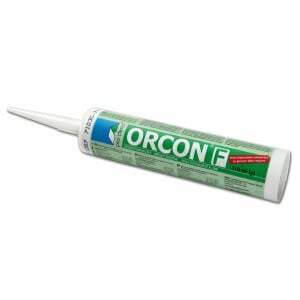 Suitable for bonding all of the Pro Clima vapour checks and air-proofing membranes, PE/PA/PP and aluminium foils to other building materials regardless of smooth, rough or smooth stony surface. Exceptionally high adhesion properties, while also being elastic. Outstanding adhesion to building materials, giving the joint the necessary safety and longevity. Airtight outdoor joints e.g. vapour check for external roof insulation or sub-and-top refurbishment vapour check for re-roofing. Easy press extrusion gun is available with 600ml refill tubes. NB Unstable or crumbling surfaces either need to be removed or sanded and stabilised using Tescon Primer RP. Cartridge Size 310ml – sufficient for approximately 5 to 10 metres. 600ml refil tubes also available. Flexible multi-purpose adhesive tape for airtight bonds from Pro Clima. For internal and external use.